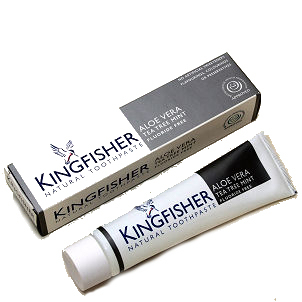 Kingfisher Natural Toothpaste is the UK’s leading brand of natural toothpaste. Kingfisher Aloe Vera Tea Tree & Mint Toothpaste (Fluoride Free) contains no artificial colourings flavourings sweeteners or preservatives. Instead they use natural ingredients. Calcium carbonate, glycerin, aqua, sodium lauryl sulfate (from palm oil), hydrated silica, cellulose gum, melaeuca alternifolia (tea tree), citrus limonum (lemons), aloe barbadensis (aloe vera), foeniculum vulgare, limonene. There are currently no questions to display about Kingfisher Aloe Vera Tea Tree & Mint Toothpaste (Fluoride Free) - 100ml.